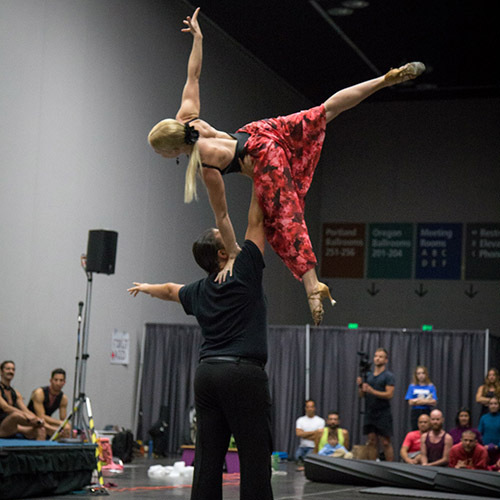 Professional dancers, acrobats and teachers, Jessica Lindsey and Chad Brooks, are guaranteed to bring excitement to your event! Whether it's a corporate function that needs a special theme with a performance or lesson, or a party that could use some awesome acrobatics to liven the mood, we promise you a night you and your guests will not forget! Make your corporate functions the highlight of your employees year! Havanna Nights (Cuban/Latin themed) - included Salsa lesson and competition, best dressed man and woman awards, and professional Latin dance performances. Masquerade Ball (Formal/Semi-Formal theme) - included traditional style dance lesson, best costume and mask awards, and professional Ballroom and Theatrical dance performances. Espionage (007 theme) - included high performance vehicle showcase, custom short film to suggest covert operations of upper management personel, and professional Tango and Acrobatic performances. Brazillian Jungle (Rain Forrest theme) - included Jungle themed karaoke contest (you never know who can hit those high notes), Samba dance lesson, and professional Samba, Salsa and Rumba dance performances. We have performed in an amazing variety of venues, including: The Portland Museum of Fine Art, The Portland Spirit, The Oregon Convention Center, The Rose Festival, countless resorts and hotel ballrooms across the country, and even on the streets of Austin during South By Southwest. Where ever you are hosting your event, we can meet the challenges the space provides and deliver an amazing quality show experience for your workforce. Did you know the National Institute of Mental Health reports that 74% of Americans have a fear of public speaking? Lucky for you, Chad not only isn't afraid of it, he thrives in the role of public speaker. Let us handle all the communication of the evening so you can sit back and enjoy the party too. We've run hundreds of events, from weddings, to parties, to festivals, and we can handle your corporate event. By the end of the night your whole company will think you're amazing for bringing in the best entertainment in Portland! Are you hosting a community event and need some zest? Most churches are great venues for dancing. Wide open spaces, beautiful decor, and a community that already has a great deal of respect and love for each other. We can come to your congregation and teach a 45-60 minute dance lesson that builds in partner rotation and encourages members to meet and interact with others they may not have known before. The strength of any community comes from the individual connections built between the members. After our lesson, we'll DJ a dance party and keep your members moving and having a great time! We have taught, lectured and performed at Fitness, Yoga, Acrobatic and Dance festivals all over the U.S. and to international crowds. If you are hosting a festival and would like professional entertainment, or need highly motivating and energetic instructors, we are always prepared to perform and teach Dance, Acrobatics and Yoga. Or if your festival needs entertaining speakers to provide exciting and engaging Ted Talks style information, we are absolute fanatics about the cutting edge research happening in the areas of fitness and movement, anatomy and physiology, and the dynamics of communication and interpersonal connection. You know what is better than professional performers coming to your facility to entertain your residents? Professional performers with amateur students that are in the same age demographic as your residence. It never fails to inspire when our beloved Margaret, at 80 years young, gets on the floor with Chad to perform an uptempo Latin dance. 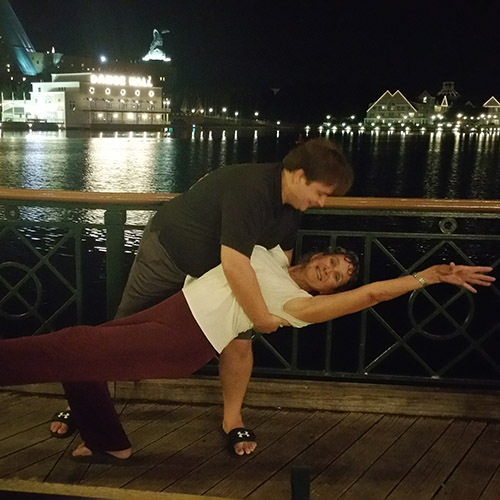 After our performances, we promise your residents will want to dance more... and we're happy to bring regular dance classes (and yoga classes) to your facility for the convenience of those who are interested. We always find a great deal of joy in witnessing the return to a more active and mobile lifestyle when working with our valued senior citizens.